Danville Services of Oregon, based in S.W. 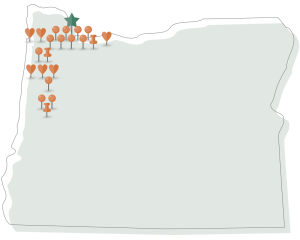 Portland, began providing essential support services to people with disabilities in 1997. Today, our programs are located throughout Marion, Washington, and Multnomah Counties. We support individuals with intellectual and/or developmental disabilities, as well as people with co-occurring mental health needs, behavioral needs, and complex medical support needs. Our intimate residential settings help our clients gain a sense of independence and more successfully integrate into the community. Danville Services of Oregon recognizes the importance of collaboration and teamwork, and as such is committed to providing real-time transparency to guardians and family members of the individuals we support. We offer online access to all documentation including Incident Reports, on-going chart notes, medical and medication administration records, etc. Danville Services is currently hiring Direct Support Professionals in Portland, Salem, Salt Lake City, Las Vegas, St. George, Orem, Provo and Tucson. Copyright © 2019 · Danville Services · Site by LargeMountain.